Hi everyone, Jana Maiwald-McCarthy back again and I have a new layout to share with you! 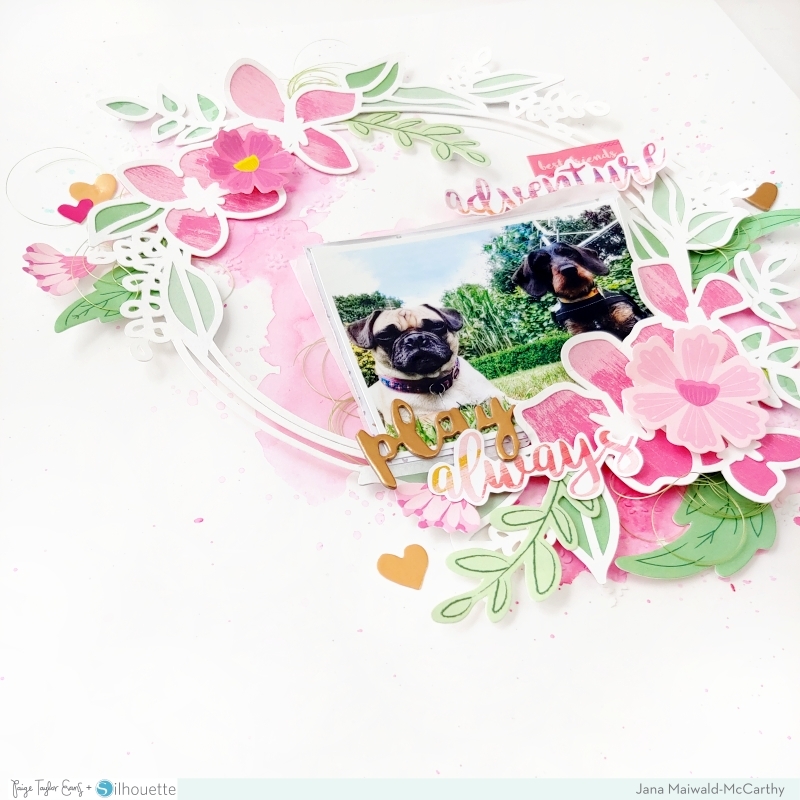 For this page I used Paige's Flower Wreath cut file and some bits from the new Horizon line and the Whimsical Collection. 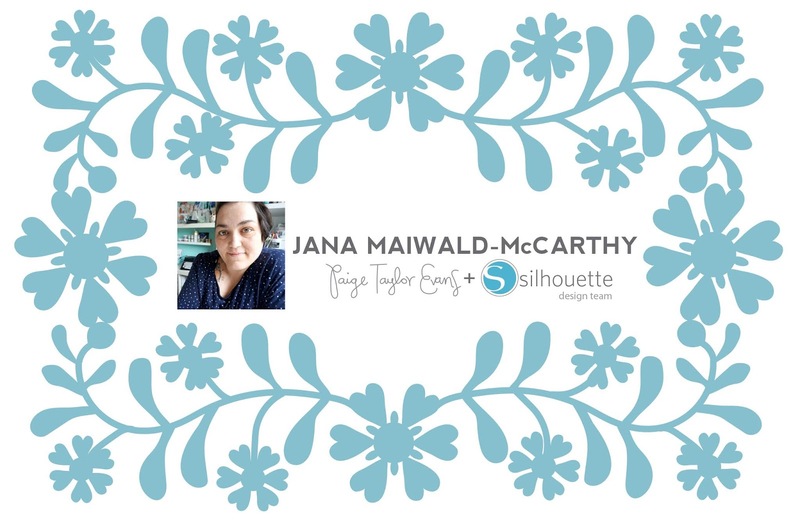 I started by making the cut file smaller and cut it from white cardstock using my Silhouette Cameo. I backed the open flowers with Paper 09 from Horizon and the leaves with Paper 01 and Paper 05 from Whimsical. I wanted to add some mixed media to my background and I started with a stencil and my favorite modeling paste. Once that was dry I grabbed some Magical Powders for some pretty colors. I decided to go with pink and a tiny touch of mint. The background turned out great and I placed the finished Flower Wreath on top of it. I grabbed the Floral Die Cuts from Whimsical to add some more flowers. I also had a look into the Floral Die Cuts from Horizon and placed three more flowers on top of the wreath. The picture shows the dogs from my best friend and they are the cutest. I fussy cut some matching words from Horizon Paper 04 for my title and also added a Chipboard Sticker. The final touches were some heart Chipboard Stickers and Stickers. I placed everything near the picture and I am totally in love with this page. I really hope you're inspired to use a Flower Wreath cut file very soon! 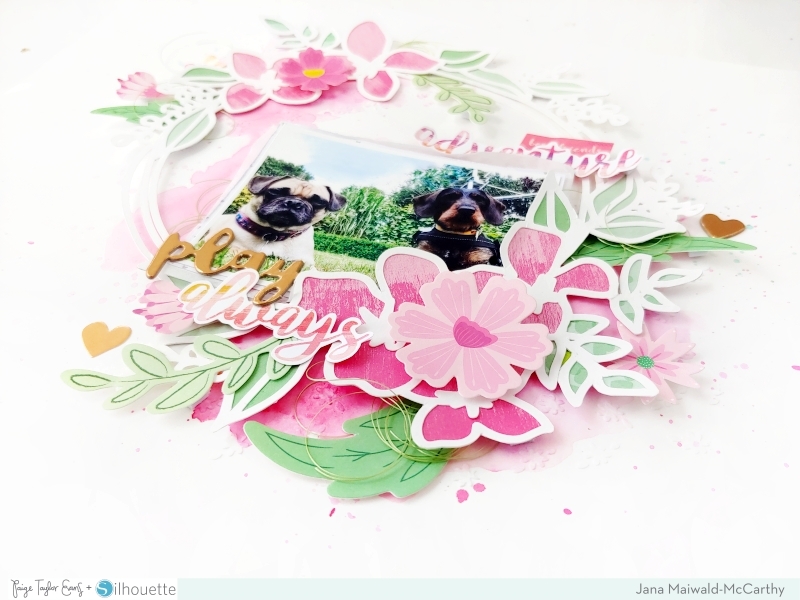 Be sure to check out Paige's cut files for ideas and inspiration. I always get ideas and I always find a perfect cut file for my next project! Thanks so much for stopping by and I wish you all a great day! This is beautiful! LOVING that sweet photo and those flowers!!! !